The Seattle-based carrier will be the first major U.S. airline to make the switch from paper to iPad when all its pilots receive a tablet by mid-June. Alaska is making the switch "as part of an ongoing effort to use technology to enhance flight safety, improve efficiency and protect the environment," according to a statement from the airline. "We've been exploring the idea of an electronic flight bag for several years, but never found a device we really liked," Gary Beck, Alaska VP of flight operations, says in the statement. "When the iPad hit the market, we took one look at it and said this is the perfect fit." 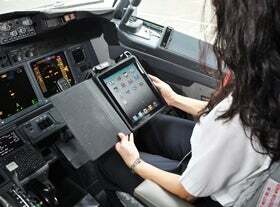 Pilots will get iPads with GoodReader installed with PDF versions of flight, system, and performance manuals in addition to reference cards and other materials. The electronic manuals are also being updated to include hyperlinks and color graphics, which Alaska says helps pilots find information "faster and easier" than with the traditional paper documents. Pilots aren't getting any special treatment compared to in-flight consumers. The cost of the tablets will be offset by lower printing and distribution expenses and lower fuel consumption in aircraft since the tablet replaces several pounds of paper manuals, according to airline. Alaska also hopes the decrease in weight will help prevent back and muscle injuries caused by pilots lugging documents around. Alaska is also looking into replacing paper navigation charts with electronic versions that would work on the iPad. The Federal Aviation Administration approved the use of iPads instead of paper charts for on-duty pilots earlier this year.